Google is counting down to 2009 with us in its own way : by showing us tips of how to use various Google services on each day in this month. Today’s tips is to keep an eye on your stocks by searching for its Stock Symbol using Google. 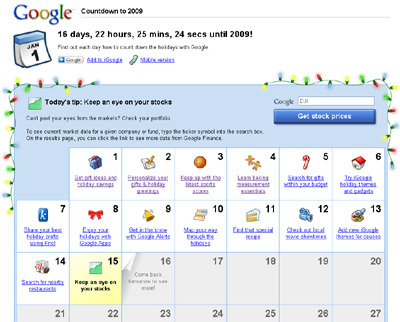 Anyway, head over to Google Countdown To 2009 page and check out all 15 tips so far. In fact, instead of showing us tips for existing services I would love to see them revealing information on new services that they’ll release next year. It’ll be more interesting then, don’t you think so?